Researchers have found that the rotation axes of super-massive black holes of some quasars are parallel to each other. New observations with the European Southern Observatory’s Very Large Telescope (VLT) in Chile have revealed alignments of the largest structures ever discovered in the universe. A team led by Damien Hutsemékers from the University of Liège in Belgium has found that the rotation axes of the central super-massive black holes in a sample of quasars are parallel to each other over distances of billions of light-years. The team also has found that the rotation axes of these quasars tend to be aligned with the vast structures in the cosmic web in which they reside. 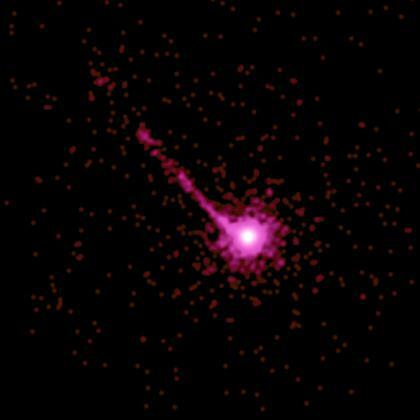 Quasars are very active super-massive black holes at the nuclei of galaxies. These black holes are surrounded by spinning disks of extremely hot material that is often spewed out in long jets along their axes of rotation. Quasars can shine more brightly than all the stars in the rest of their host galaxies put together. 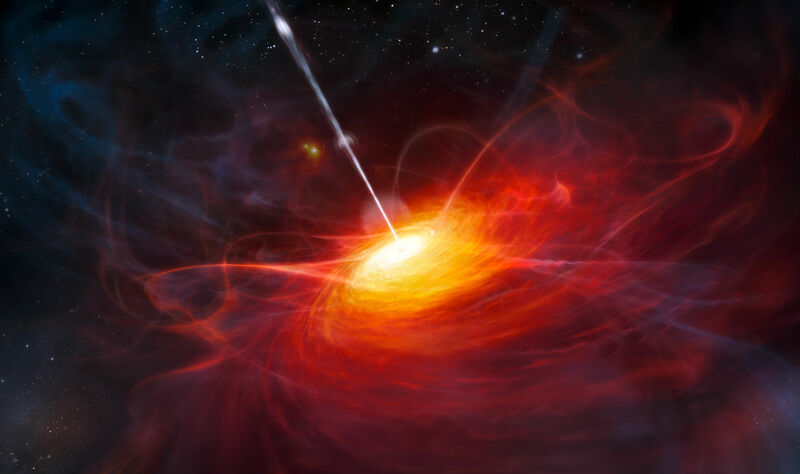 “The first odd thing we noticed was that some of the quasars’ rotation axes were aligned with each other, despite the fact that these quasars are separated by billions of light-years,” said Damien Hutsemékers from the University of Liège in Belgium. His team used the FORS instrument on the VLT to study 93 quasars that were known to form huge groupings spread over billions of light-years, seen at a time when the universe was about one-third of its current age. When astronomers look at the distribution of galaxies on scales of billions of light-years, they find that they are not evenly distributed. 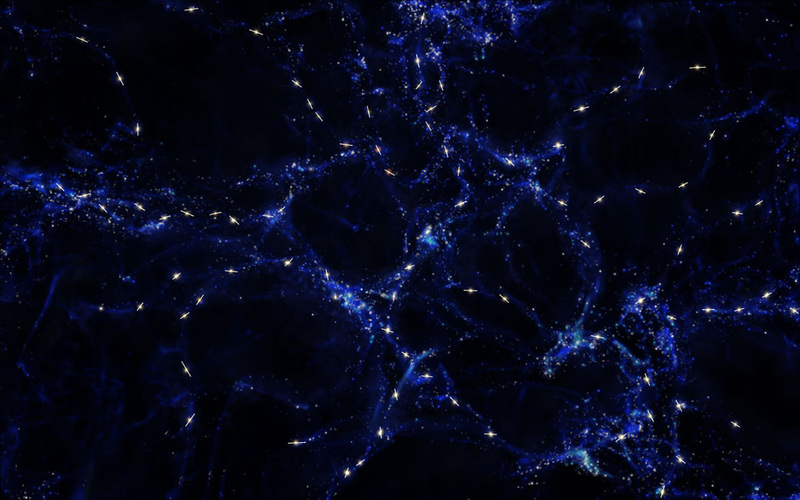 They form a cosmic web of filaments and clumps around huge voids where galaxies are scarce. This intriguing and beautiful arrangement of material is known as large-scale structure. 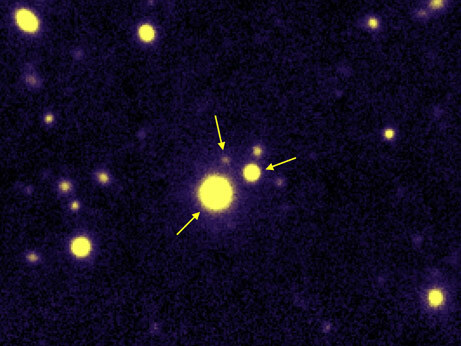 Dr. Hutsemekers and his colleagues found that the spin axes of the quasars were linked not just to each other, but also tend to be parallel to their host large-scale structures. The new VLT results indicate that the rotation axes of the quasars tend to be parallel to the large-scale structures in which they find themselves. So, if the quasars are in a long filament, then the spins of the central black holes will point along the filament. The researchers estimate that the probability that these alignments are simply the result of chance is less than 1 percent. “A correlation between the orientation of quasars and the structure they belong to is an important prediction of numerical models of evolution of our Universe. Our data provide the first observational confirmation of this effect, on scales much larger that what had been observed to date for normal galaxies,” said Dominique Sluse of the Argelander-Institut für Astronomie in Bonn, Germany. 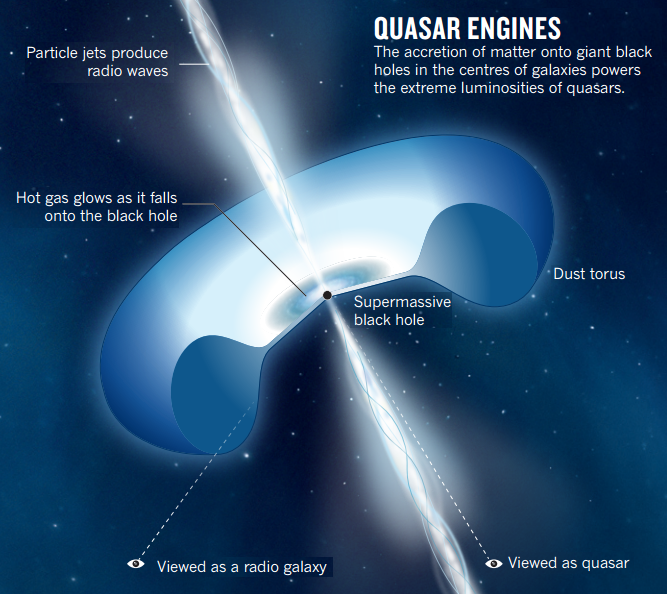 The team could not see the rotation axes or the jets of the quasars directly. Instead they measured the polarization of the light from each quasar and, for 19 of them, found a significantly polarized signal. The direction of this polarization, combined with other information, could be used to deduce the angle of the accretion disk and hence the direction of the spin axis of the quasar. Alignment of features within large scale supercluster filaments is not new. Regarding observed properties of double galaxies and the structure of superclusters, see Tifft (1980), ApJ 239, 445, or my recently published book: Tifft (2014) “Redshift Key to Cosmology” section 2.4 and section 7.6, wherein various aspects of redshift quantization and the structure of time are discussed.